Apple is the highest user of "dirty" energy as a percentage of all energy used in its data centers, while Yahoo! is the cleanest, according to a new report by Greenpeace. Greenpeace International has released a report on the state of dirty energy use by the IT industry, and cited Apple as worst major data center user in terms of the amount of "clean energy" used. The report, which was released Thursday in a blog post by Greenpeace U.K., also said that the increasing energy efficiency of data centers should not be confused with whether the power source is "clean" or "dirty." In the online version of the report, Greenpeace released the results of a study it did of some of the largest data center users in the world, including Akamai, Amazon Web Services, Apple, Facebook, Google, Hewlett-Packard, IBM, Microsoft, Twitter, and Yahoo!. That study, based on a combination of publiclyy-available data and direct survey's of the companies involved, found Apple the lowest user of "clean" energy as a percentage of total energy used by the company's data centers, while Yahoo! received the highest rating. According to Greenpeace, only 6.7 percent of Apple's data center power use comes from clean energy, which the organization said includes wind power, solar energy, hydropower, bioenergy, geothermal power, and marine or ocean wave power. HP did barely better than Apple, with only 9.9 percent of its data centers' power coming from clean energy, followed by IBM with 10.9 percent and Facebook with 13.8 percent. At the other end of the spectrum was Yahoo!, which Greenpeace said got 55.9 percent of its data centers' power from clean energy sources. Google was second with 36.4 percent of its data center power coming from clean energy sources, followed by Amazon Web Services at 26.8 percent, Microsoft at 25.0 percent, and Twitter at 21.0 percent. 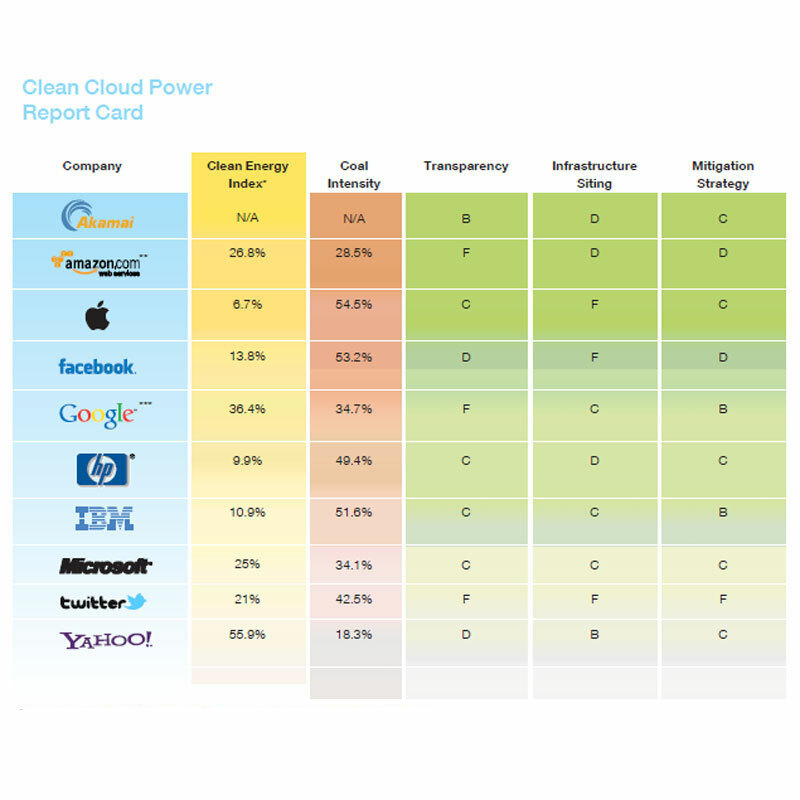 Greenpeace did not provide a clean energy rating for Akamai. Greenpeace also said that 54.5 percent of the power used in Apple's data centers came from coal, compared to 53.2 percent for Facebook, 51.6 percent for IBM, and 49.4 percent for HP. Greentech Media, on online provider of news and analysis of green technology, criticized the Greenpeace report by noting that IT companies are opening more energy-efficient data centers, and that increased used of virtualization and cloud computing help cut power consumption by getting rid of servers and other equipment that would otherwise have been put in use, and by such activities as making videoconferencing an alternative to business travel. Greentech Media also said that data center power use is still a relatively small part of total power consumption when compared to lighting, which in the U.S. accounts for 21 percent of power consumed. "So why is Greenpeace highlighting datacenters? Who knows? Perhaps the practices of Apple and Facebook make better headlines than those of Toyo Chemical Industries. IT industries also tend to respond more quickly to these sort of reports than mining companies in Ukraine," Greentech Media wrote. Greenpeace, in its report, anticipated some of those arguments. The organization said that businesses, like consumers, have a choice about their energy use, especially as the amount of information being generated and used continues to grow. In an increasingly connected world, data centers are the factories of the 21st Century, Greenpeace wrote. "Whereas the factories of the Industrial Revolution got us into a mess by burning coal and releasing carbon pollution into the atmosphere, the factories of the Technology Revolution have the ability to make use of better energy choices...It is clear that (major IT brands') commitment to transformative change, which includes responsibility for their own growing footprint, is still in question," it wrote. Greenpeace also said in its report that a commitment to data center energy efficiency is not the same thing as committing to clean energy. "This failure to commit to clean energy in the same way energy efficiency is embraced is driving demand for dirty energy, and is holding the sector back from being truly green," it wrote. Greenpeace also criticized companies like Google, Apple, and Facebook for building major data centers in rural North Carolina. Those companies are attracted by both tax incentives and the availability of cheap electricity, Greenpeace said. "Unfortunately, the generation mix in North Carolina is one of the dirtiest in the country, with only 4% of electricity generation from renewable sources and the balance from coal (61%) and nuclear (38%)," it wrote.